7 June 2016, at 6:00a.m. 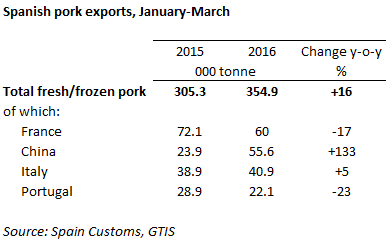 SPAIN - Exports of fresh/frozen pork from Spain have grown strongly in the first quarter of 2016, when compared with the same period a year earlier. Volumes were up 16 per cent to 355 thousand tonnes. This growth, as with other member states, was largely attributed to increased shipments to China. These more than doubled in Q1 2016 from last year. As widely documented, the high pig price in China is attracting exports from all major producing nations, coupled with the increased demand from China that it cannot satiate domestically. Shipments to Italy also recorded an increase, of 5 per cent , while sales to the UK were up 16 per cent . France remains the largest importer of Spanish pork, although volumes were reduced by 17 per cent on last year. As there looks to be little sign of any tightening of supplies in the Spanish pig herd, we may expect to see Spanish export levels continuing to rise throughout the year. Imports of fresh/frozen pork into Spain fell by 8 per cent , to 26.1 thousand tonnes, in the first quarter of 2016, when compared with the same period a year earlier. Shipments from France and the Netherlands both recorded significant declines (-26 per cent and -27 per cent respectively), while imports from Poland and Portugal increased in volume, albeit from a smaller base.